My sweet tooth today has me craving dessert, so I thought I’d make a dessert flatbread. 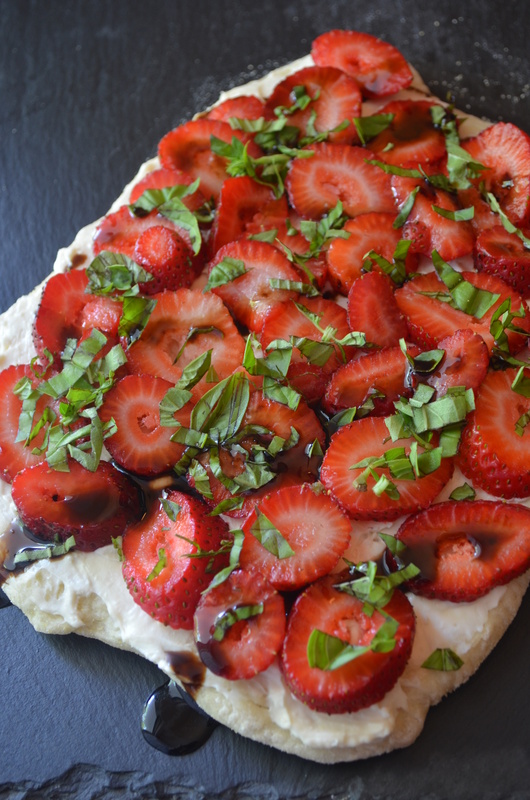 This lovely little dessert has sweetened vanilla cream cheese as a base and is topped with sliced strawberries and basil. Slice of fresh summer peaches would be a lovely substitute for the strawberries. I topped it with fresh basil, which is incredible on strawberries and peaches. This dessert comes together in minutes and is gorgeous as well as delicious. I drizzled 18 year old balsamic vinegar on it, but that’s optional. It’s perfectly delicious without vinegar. Bake Naan according to package directions. Beat together softened cream cheese, heavy whipping cream, powdered sugar and vanilla extract. Spread over the flatbread. Rinse, hull, dry and slice strawberries. Place berries on the cream cheese. Slice basil and sprinkle over flatbread. If desired, drizzle a tiny bit of excellent quality aged balsamic vinegar on the dessert. Slice and serve. Note: If you use balsamic vinegar, make sure it’s excellent quality and you taste it before drizzling any over the flatbread. Enjoy with a glass of red wine or port. 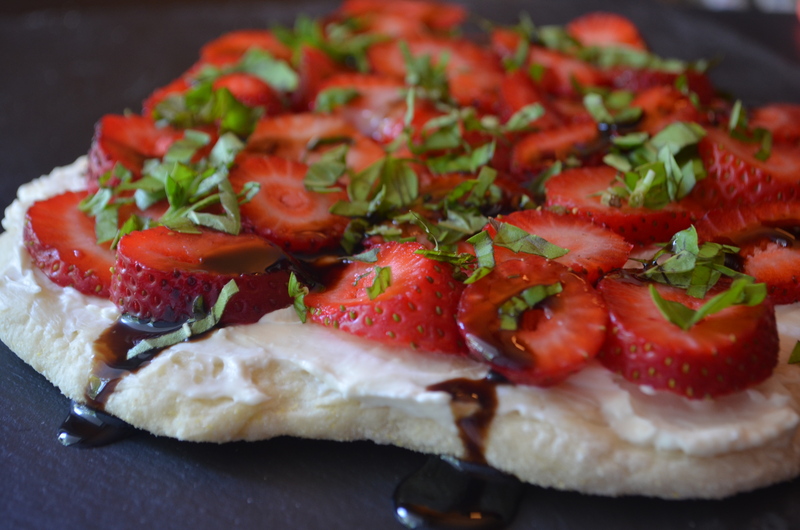 This entry was posted in Desserts and tagged basil, cream cheese, dessert, easy, Entertaining, flatbread, Naan, Party, quick, strawberries, summer dessert, sweet, treat on July 31, 2015 by Juliana Goodwin. 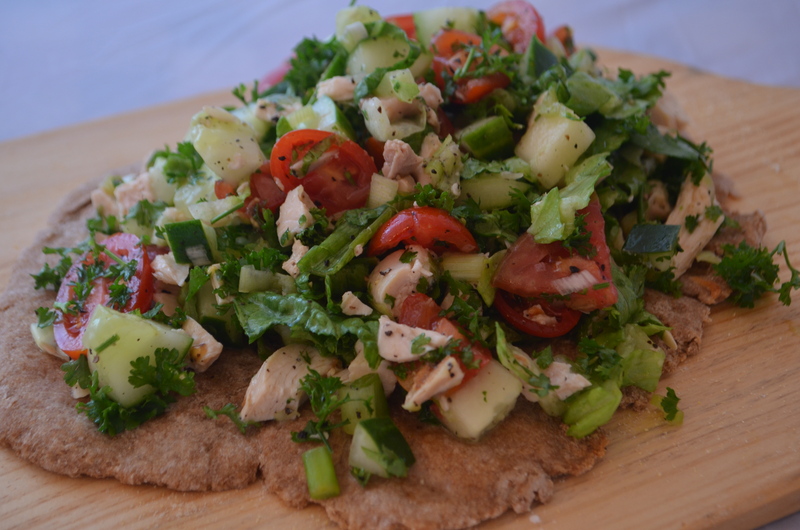 This flatbread is so easy to make and makes a quick dinner or appetizer. It takes 20 minutes from start to finish. You can top it with cilantro, sour cream, tomatoes, black olives — anything you’d like. I use red enchilada sauce, but it’s delicious with green, too. In a medium bowl, stir together cream cheese and taco seasoning, divide it in half and spread half on each Naan crust. Then, in the same bowl, mix refried beans, salsa and garlic salt to taste. Spread that over the cream cheese mixture. Pull the chicken breasts off the rotisserie chicken and shred it with your hands. I put the chicken in the same bowl I’ve been using so I don’t’ dirty any more dishes. Stir together the chicken and enchilada sauce and then spread the mixture on each piece of Naan. Top with cheese. Bake 9 minutes. Chop green onion and use it to garnish the flatbread. If desired, garnish with sour cream, too. 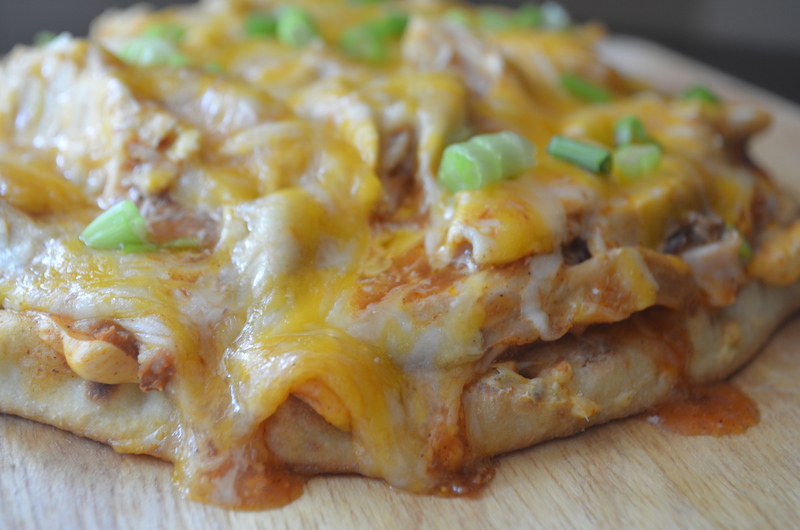 This entry was posted in Appetizers, Main Courses and tagged cheese, cream cheese, easy, enchilada, flatbread, mexican, quick, refried beans, rotisserie chicken, sour cream on July 30, 2015 by Juliana Goodwin. Divine. Heavenly. That’s how I’d describe my Chicken, Bacon, Gorgonzola Flatbread, which is bubbly, creamy, bacon goodness. Every day this week, I am showcasing a new flatbread creation and this is my favorite so far. Now, I am not done creating yet, but I’m in the home stretch. 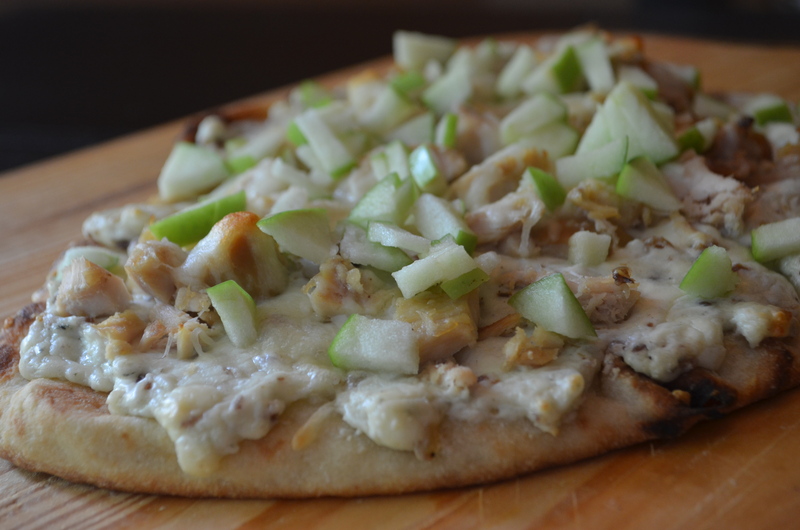 This wonderful flatbread is topped with bits of tart apple that provide a nice contrast in terms of texture and flavor. This pairs beautifully with red wine. The funny thing is I don’t usually like blue cheese, but Gorgonzola is much lighter than many other varieties and this doesn’t even taste like blue cheese. So if you think you don’t like blue cheese, it’s still worth trying this. I can’t wait to eat it again. Stir together cream cheese, bacon, heavy whipping cream, garlic powder and Gorgonzola. Set aside. Remove the breasts from the rotisserie chicken and chop those. Finely mince the Granny Smith apple and set aside. When oven is preheated, spread half the cream cheese mixture on each flatbread. 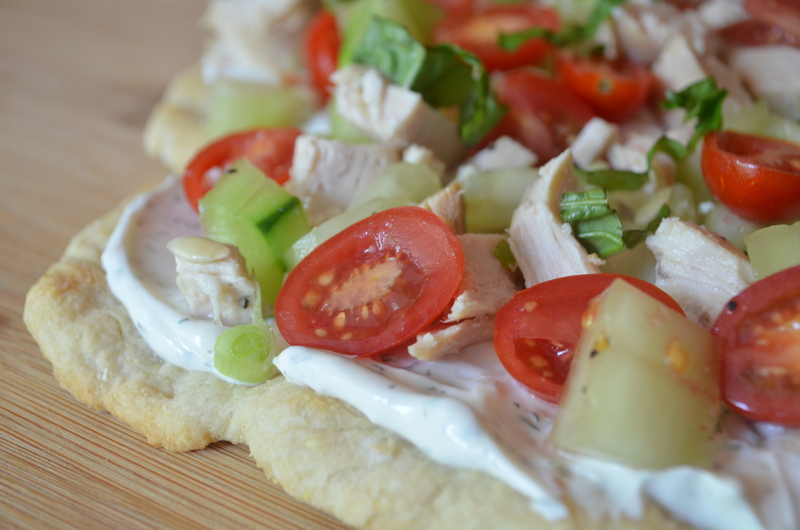 Sprinkle half the chicken on each flatbread and top with Mozzarella cheese. Bake for 9 minutes. Then sprinkle with the apple and serve. This entry was posted in Appetizers, Juliana's Favorites, Main Courses and tagged bacon, cheese, chicken, delicious, easy, flatbread, gooey, Gorgonzola, Granny Smith apple, Party, pizza, rotisserie chicken, simple on July 28, 2015 by Juliana Goodwin. Flatbread week continues with another cool flatbread. Flatbreads are usually served warm, but it’s so hot. I am in the mood for something refreshing. This is REFRESHING! I don’t know how hot it is where you are, but we have a heat index of 108 today! So, cool is key. This flatbread was inspired by Greek salad and dill dip. You could add feta to this if you wanted, but I love it as is. Mix sour cream, dill, chopped garlic and sliced green onion. Cover and refrigerate for 2 hours. When time to assemble, toss together chicken, cucumber, tomatoes, lemon juice and olive oil. Add salt to vegetables and toss. Then spread half the sour cream mixture on a cooked flatbread crust. Top it with half the vegetable and chicken mixture. Finely slice the basil and sprinkle it on top. Repeat the process for the second flatbread, then slice and serve. 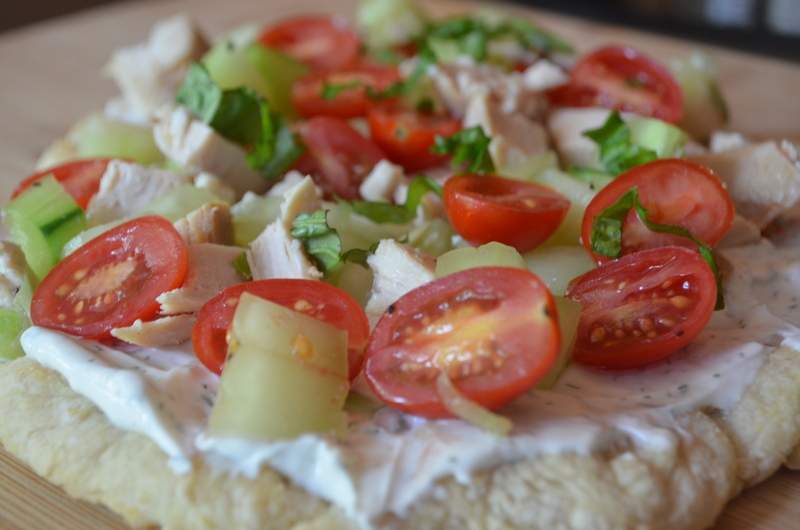 This entry was posted in Appetizers, Main Courses and tagged Appetizer, cool, cucumber, dill, flatbread, lunch, Naan, Party, rotisserie chicken, snack, sour cream, tomato on July 28, 2015 by Juliana Goodwin. I declare this flatbread week! Every day this week I am posting a delicious flatbread, most of them will use rotisserie chicken and be incredibly easy recipes. This is my Hot Wing Flatbread, which was inspired by hot wings. I loved wings in college, but I can’t touch them now. If I did, I’d be up all night with heartburn. So I decided to take the flavors behind the wing and transform it into a flatbread and the results were FABULOUS. 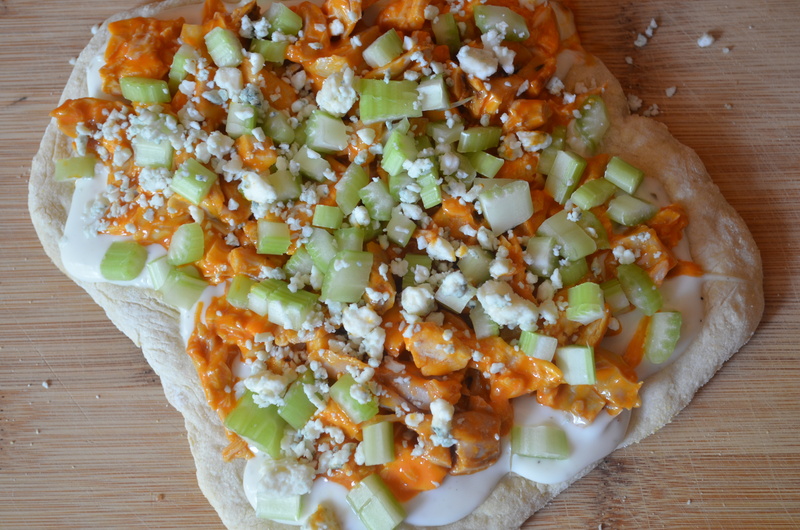 I spread Ranch dressing on a prebaked crust, topped it with rotisserie chicken that was tossed in hot wing sauce, added celery and blue cheese crumbles. It’s delightful and didn’t give me any heartburn. This is actually served cool, so it’s excellent on a hot summer day. I made my own crust. My recipe is simple- it contains flour, salt, yeast and water—but it needs six hours to rise so it’s not something that can be prepared at the last minute. If you want to simplify this recipe, just use Stonefire Tandoori Baked Original Naan which makes the perfect crust. When you bake it, it’s crisp on the outside but still slightly chewy on the inside. I started crafting flatbreads this weekend and my inspiration was endless, so I decided to post one recipe a day here. I hope you enjoy flatbread week. I recommend using the breast meat for this recipe. Pull off the chicken breast and finely chop it. Then toss it in the wing sauce and stir to coat the chicken. Mince two small celery stalks. Next, spread Ranch dressing on a precooked flatbread. Top with the chicken. Sprinkle with celery and Gorgonzola and serve. Stir together flour, yeast and salt. Then add warm water, stir, and then use your hand to gather dough into a ball. Drizzle olive oil over the dough, cover the bowl with a clean towel and place on the oven to rise for 6 hours. Turn the oven on to 200 degrees to help it rise. When it’s time to cook, preheat oven to 450 and place a baking sheet in the oven to heat. Split the dough in half. Coat your hands with flour and work the dough into a ball (you may need more flour). Start working the dough in your hands, pinching it to spread it out in your hands. Sprinkle corn meal and flour on a flat surface. Then put the dough down and continue to stretch it until you have a piece of flatbread. When oven is preheated, remove the baking sheet, sprinkle it with cornmeal to keep the dough from sticking, and bake the flatbread for 10-13 minutes. This entry was posted in Appetizers, Main Courses and tagged Appetizer, blue cheese, celery, cool, crust, dinner, easy, flatbread, Gorgonzola, healthier, hot wings, lunch, Naan, Ott's, quick, Ranch dressing, rotisserie chicken, simple on July 27, 2015 by Juliana Goodwin.